I have numerous lines all starting with http. I need to add some text in front of it in every line. Also, I need to add different text to the end of each line. Each line ends differently. What is the fastest way to add text to the start and end of each line? Press Ctrl+H to bring up the Find/Replace Dialog. 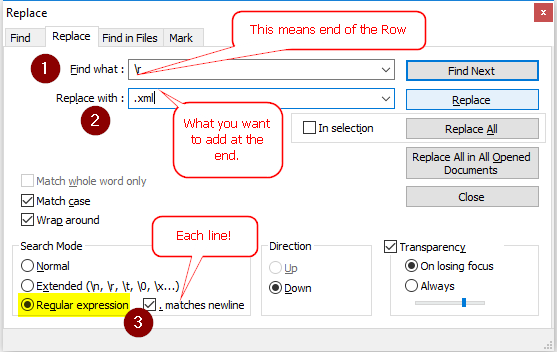 Choose the Regular expression option near the bottom of the dialog. This allows you to type on every line simultaneously. I found the solution above here. 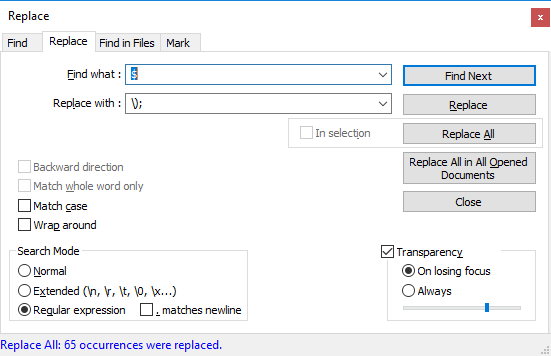 I think this is much easier than using regex. 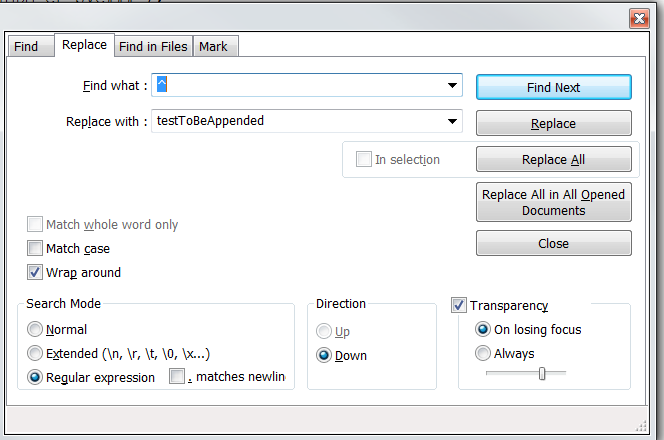 Notepad++ has a very powerful editing capability. 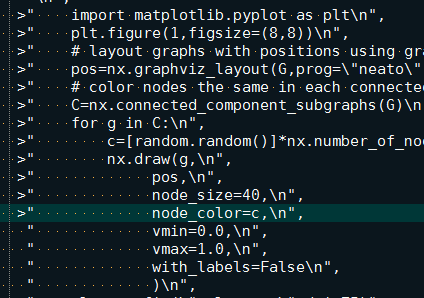 (Today I'm searching for the similar function in Sublime Text), but for Notepad++, just hold Alt when you drag the mouse. 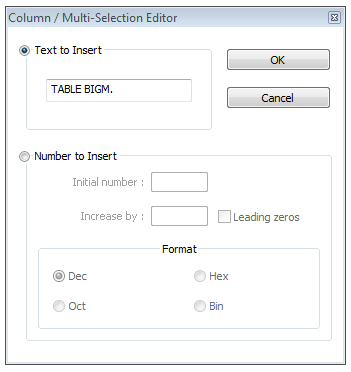 What you type will then replace the selected column on every line. 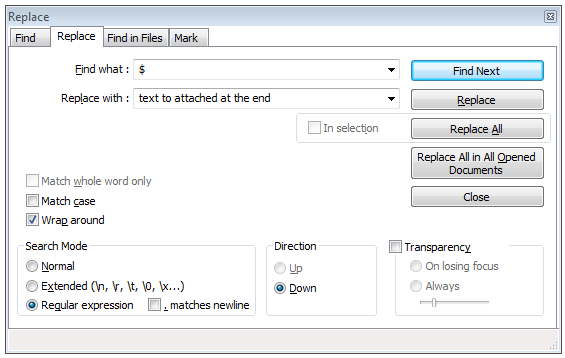 To insert without replacing existing text, use Alt-Shift. Explanation: Expression $1 in Replace with input denotes all the characters that include the round brackets (. *) in Find what regular expressin. 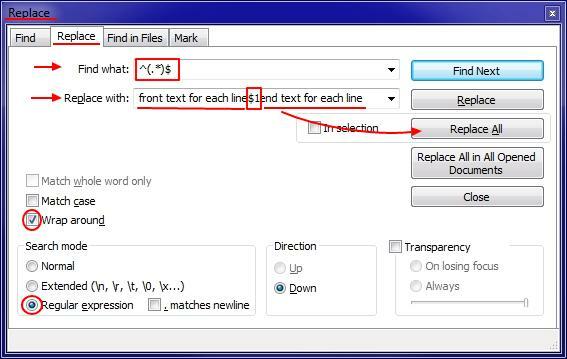 Open Notepad++, then click Ctrl+ F.
*Find What: "^" (which represents index of the each line). if you have several lines, and you are aiming to add that text to the end of the each line, you need to markup the option ". matches newline" in the "Search Mode" group box. Well, I am posting this after such a long time but this will the easiest of all. To add text at the beginning/a-certain-place-from-start for all lines, just click there and do ALT+C and you will get the below box. Type in your text and click OK and it's done. To add a certain text at end of all lines, do CTRL+F, and choose REPLACE. You will get the below box. Put in '$' in 'find what' and in 'replace with' type in your text.Make sure you choose 'regular expression' in the search mode (left down). Finally click 'replace all' and you are done. That's it. Now you have a giant cursor. You can write anything to all of these lines. 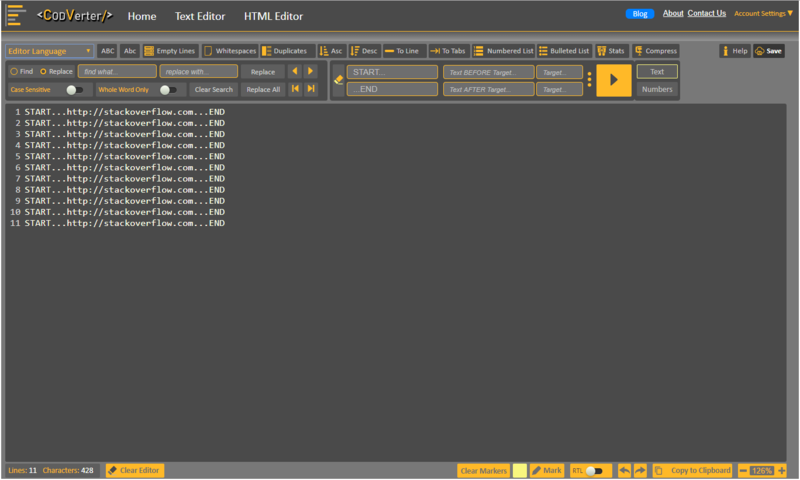 To append different text to the end of each line, you can use the plugin ConyEdit to do this. With ConyEdit running in the background, follow these steps. use the command line cc.gl a to get lines and store in an array named a.
use the command line cc.aal //$a to append after each line, using the contents of array a. Now we need to add the string 'START...' in front of it in every line and the string '...END' at the end of each line. It's online and highly secured. Everything you do is interpreted on your local computer and never sent back to the server. (Full Disclosure: I am one of the developers). How may I apply double quotes around every value of csv file using TextMate?